But where can you get them? Which ones should you use? Dictionaries are indispensable if you're a language learner. That applies from day one and never stops. It's no secret that the best writers, poets and editors are never far away from their favourite copy. But if you're new to Esperanto, then how are you going to find one? How do you know which ones are reliable? That's an important point; some dictionaries are rotten. To make life easier for you, we've linked to our recommended one-way and two-way online dictionaries at the top of this page and in the site's menu, and we present some other dictionaries below. Click a button to go to your preferred section, or just scroll down if you prefer. The best monolingual dictionary is found at vortaro.net. 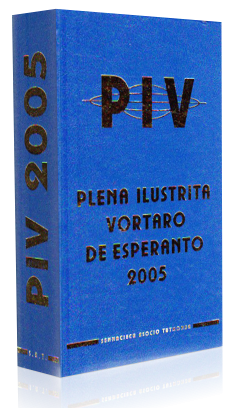 It's an online version of the largest Esperanto dictionary, the Plena Ilustrita Vortaro. The interface has an autofill feature and will offer several words whilst you type based upon the letters you enter. If you're looking for translations between Esperanto and English, then the dictionary provided by the team at lernu.net is probably the best combination of reliable translations, number of words, and ease of use. It's possible to search for a translation of your Esperanto word or switch directions and see what it gives for an English one. The interface has an autofill feature and will offer several words whilst you type based upon the letters you enter. ReVo (Reta Vortaro) is pretty good but be warned; it's aged interface is not friendly to mobile users. If you want something to use offline and are on mobile, then you can download PReVo (Portebla Reta Vortaro), an offline dictionary for Android and iOS. You can't learn a language without a dictionary and paper ones have been the traditional way to go. It wasn't until Esperanto was approaching a quarter of a century that a dictionary giving definitions in Esperanto appeared. This was Kabe's Vortaro de Esperanto, published in 1911. The first truly comprehensive dictionary written in Esperanto arrived in 1930, when the Plena Vortaro de Esperanto appeared, which is still relevant today as the foundation of the online Reta Vortaro. The standard reference is now considered to be the colossal Plena Ilustrita Vortaro de Esperanto, originally introduced in 1970 and last updated in 2005. Its over 1200 pages hold more than 16,000 headwords and nearly 47,000 total entries. Although it does contain some simple illustrations, it's not a picture dictionary; 'ilustrita' in its title refers to presenting sentences illustrating how the words are used. Since 2010, PIV has been freely consultable online at vortaro.net. 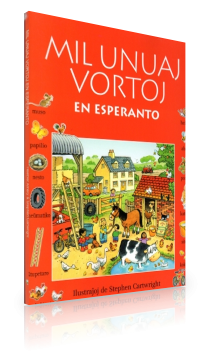 We recommend the most authoratitive Esperanto dictionary, the Plena Ilustrita Vortaro. The first booklets published in Esperanto came with wordlists providing translations. The initiator of Esperanto, Ludoviko Zamenhof, published his Universala Vortaro in 1894. Users could look up an Esperanto word and see translations in French, English, German, Russian and Polish, incidentally the languages which the first book in Esperanto, the Unua Libro, was originally published in. The UV was consolidated into the Fundamento of Esperanto in 1905. The pioneers of the Esperanto movement quickly filled the gaps in their native languages' markets, churning out dictionaries of varying quality. (You have to bear in mind that these first Esperantists were beginners!) Quite often small, they have value to scholars of Esperanto but aren't particularly useful for modern learners. The best bet is to go with newer dictionaries. They don't necessarily have to be large, although clearly there's correspondence between how big a dictionary is and how many entries it will hold. John Wells's dictionaries have been the standard for decades, updated in 2010 to capture words useful in the modern world. Peter Benson's Complete Esperanto-English Dictionary is hard to find but well worth purchasing. We recommend John Wells's English-Esperanto-English dictionary, which contains over 30,000 entries. It's available in hardback and paperback. The most accessible dictionaries are picture dictionaries, presenting you with related words which you can recognise at a glance. Don't be fooled into thinking they're just for children; they're incredibly useful ways of quickly building up vocabulary for learners of all ages. The most comprehensive can even be great tools for writers, presenting them with variations which most likely wouldn't even be in the best paper dictionaries, such as the different equipment you'd find in a gym. The picture dictionary which best combines usefulness with value is Mil Unuaj Vortoj en Esperanto, part of Osborne's First Thousand Words range. 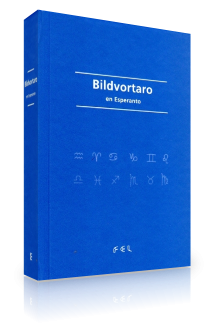 The most detailed picture dictionary is Bildvortaro, a hefty hardcover developed from the internationally renowned Duden range. Fully comprehensive over more than 800 pages and weighing around 1.2kg, you're bound to find what you're looking for and more!